Sanctions of Russia against representatives of private joint-stock company Darnitsa Pharmaceutical Firm (Kyiv) would not affect operations of the company and its financial indicators, the company has said. "Darnitsa has stopped deliveries to the Russian Federation since 2017, so the sanctions will not affect economic activity and financial performance. The strategic goal is to provide Ukrainians with high-quality and affordable medicines. Therefore, most of the Darnitsa drugs are sold on the domestic market," the company told Interfax-Ukraine. At the same time, the company connects the inclusion of its representatives in the sanctions list with political rather than economic reasons. "Three representatives of private companies got to the sanctions list of the Russian Federation, along with Volodymyr and Hlib Zahoria, Dmytro Shymkiv was also included in the list. From September 2018 he heads the executive board of the management company of Darnitsa Pharmaceutical Firm. 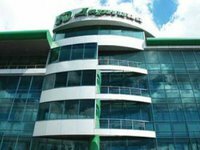 We associate the inclusion of representatives of Darnitsa in the sanctions list with political, not economic reasons," the company said. As reported, the Russian government imposed special economic measures on 322 Ukrainian individuals and 68 legal entities starting today, including the blockage (freezing) of noncash monetary assets, uncertified securities, and property in Russian territory and a ban on the transfer of money (disinvestment) out of Russia. Some Ukrainian pharmaceutical companies, their owners and some lawmakers who are members of the parliamentary healthcare committee, as well as acting Health Minister Ulana Suprun, are placed on the Russian sanction list.